India's top detective agency says it will question a man police say is a notorious wildlife smuggler. Sansar Chand was arrested on Thursday after an intensive manhunt. He is wanted in a number of poaching cases. On Friday a court in Delhi remanded him in custody for 10 days to be questioned by the Central Bureau of Investigation. Mr Chand is wanted in over 40 cases of poaching and smuggling. In 2004 he was sentenced to five years imprisonment by a court in the state of Rajasthan. He was released on bail three months later and had been on the run until he was caught. 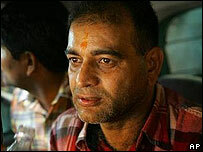 Sansar Chand is wanted by police in several Indian states. The authorities allege he is behind the recent disappearance of tigers from the Sariska reserve in Rajasthan. He was first arrested at the age of 16 after police found nearly 600 animal skins and body parts on his possession. Officials said up to 10 tigers had been poached from Sariska in the past two years - the news greatly alarmed conservationists and the Indian government which has since set up a task force to protect the tiger. The gravity of the situation was underlined by a recent appeal by the United Nations asking the Indian government to take steps to save tigers. Wildlife campaigners say that although poaching is illegal in India, hunting remains popular. They say that because police tend to ignore expeditions by the rich, famous or powerful, efforts to conserve protected animals are often hampered. Investigations into the disappearances at Sariska by the CBI revealed that forest guards were mostly unarmed and had limited communication facilities.